In this nice VIS image, taken by the NASA - Mars Odyssey Orbiter on January, 21st, 2015, we can see a portion (once again, a VERY small portion) of the large Dunefield existing on the Floor of Ruseel Crater. Russell Crater is an old Impact Crater found in the Noachis Quadrangle of Mars and centered at 54,9� South Latitude and 347,6� West Longitude. Ruseel Crater is about 139,7 Km (such as approx. 86,753 miles) in diameter and it was so named after Dr Henry Norris Russell, an American Astronomer (who was born on October, 25, 1877 in Oyster Bay - NY - USA - and died of February, 18, 1957 in Princeton - NJ - USA). Debris Flows have been observed on some of the Dunes located inside this Impact Crater, and some Planetary Researchers believe that they might have been caused by (---> related to) the presence of Liquid Water within the Crater itself. As a matter of fact, we believe that Liquid Water could be (---> remain) stable - even though for (relatively) short periods of time - during the Summer of the Southern Hemisphere of Mars and, therefore, these Gully-like Debris Flows may be due to small amounts of Water Ice melting away. 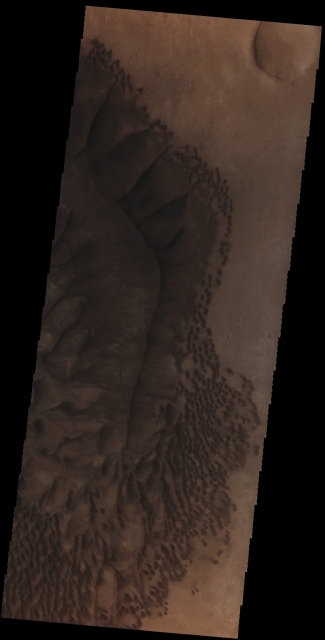 Another idea is that huge chunks of Dry Ice (CO2 Ice) could have formed on the Dunes during the long and cold Martian Winter, and then slide down along the Slip-Faces of the Dunes during the Martian Spring, when the Daytime Surface Temperature of the Southern Hemisphere of the Red Planet is (always relatively speaking) much warmer. This image (which is a crop taken out from an Original Mars Odyssey Orbiter b/w and Map-Projected frame published on the NASA - Planetary Photojournal with the ID n. PIA 19229) has been additionally processed, magnified to aid the visibility of the details, contrast enhanced and sharpened, Gamma corrected and then re-colorized in Absolute Natural Colors (such as the colors that a normal human eye would actually perceive if someone were onboard the NASA - Mars Odyssey Orbiter and then looked down, towards the Surface of Mars), by using an original technique created - and, in time, dramatically improved - by the Lunar Explorer Italia Team.